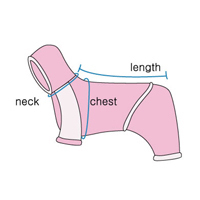 Chest: Measure the thickest part of the chest (usually behind the two front legs). You should select the size of chest at least 3~5Cm (1~2 Inch) larger than your dog's chest girth. Neck: Measure the circumference of your dogs neck. 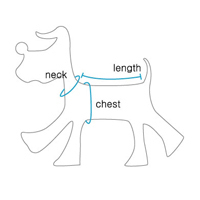 Length: The measurement from the base of the neck to the base of the tail along the dog’s backbone. Make sure your dog is standing properl, not sitting or laying down. If your pet has a stout build, a deep chest or is overweight, we recommend going up a minimum of one size for a proper fit. If your measurement falls between two sizes, determine the correct size based on how loose or tight your measurement is, a comfortable fit is preferred, not a tight restricting fit. 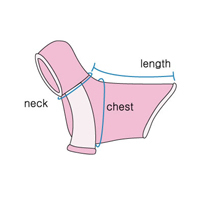 Puppy Angel Soft Harnesses are sized slightly differently as this chart shows on the left. If for any reason you are unsure, please contact us for assistance. We are always happy to help.